Nothing beats the tastes of Southern European cuisine, and Italian Restaurant Marino is Okinawa’s best at taking a bevy of fresh ingredients and transforming them into a delectable dining excursion. Marino knows well there’s no single Italian cuisine; it is, instead, the regional specialties that make it so tasty, and oftentimes, so difficult to get ‘just right’. Pastas, pizzas and carbonara is all mouth-watering, leaving customers the difficult decisions of what to even choose for dinner. Marino’s features a variety of dishes from across Italy, with pizza a specialty baked in a stone oven imported from Italy. The restaurant chefs are specialists at molding the cheeses and sauces on pizza crusts that range from Rome thin to Sicilian thick, but all delicious and doing homage to Naples, the home of pizza. Pizza prices range from ¥1,280 for a Margherita or Bologna, which is a delicious pizza topped with bacon, salami and sausage to Parmenara that costs ¥1,890. Pastas reign supreme at Marino, where tasty creams, polenta, mascarpone, grana padano and parmigiano cheeses, risotto and fresh egg pasta await. Going one better, Marino’s has one so special, it’s recipe has been patented, blending Parmesan cheese, cream and yolk in a heated earthenware pot. Then there is La Marino set that is for two persons and costs ¥3,890. It includes Caesar Salad, creamy Parmenara pasta, pizza with tomato sauce and Mozzarella topping, a dessert and soft drinks with free refills. 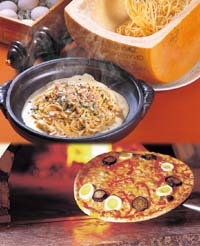 Popular group meals include Am’ore, a Cheese Fondue Set and La Marino, all offered in three different sizes to accommodate different size groups. All go well with special celebration settings such as birthday, surprise and farewell parties. Three Marino’s locations make it easy for customers. The main restaurant in Uruma City, next to San-A Gushikawan Main City, is offering a special 10% discount in December and January to customers who show this article. It’s that simple. Two other Marino’s are located at San-A Naha Main Place and San-A Nishihara City in Nishihara Town. All three Marino’s locations are open daily 11 a.m. to 11 p.m. Parking is free at all locations on adjacent San-A parking lots.